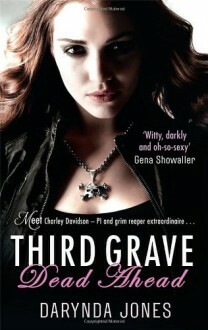 THIRD GRAVE DEAD AHEADDarynda Jones From the "New York Times" bestselling author Darynda Jones, comes the third book in her hilarious paranormal romance series. Paranormal private eye. Grim reaper extraordinaire. Whatever. Charley Davidson is back! And she's drinking copious amounts of caffeine to stay awake because every time she closes her eyes she sees him: Reyes Farrow, the part-human, part-supermodel son of Satan. Yes, she did imprison him for all eternity, but come on. How is she supposed to solve a missing-persons case, deal with an ego-driven doctor, calm her curmudgeonly dad, and take on a motorcycle gang hell-bent on murder when the devil's son just won't give up on his plan of seduction . . . and revenge?